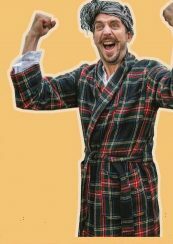 From the first moment that Murray Lachlan Young bounds onstage, his hair wrapped in a towel, his dressing gown flapping, you know you’re in for a good time. A mixture of fun poetry, stand-up comedy, storytelling and a touch of panto – all making for a positive thought-provoking and hilarious experience. A raucous, funny, silly, scary hour of merriment and mayhem. Please note that Murray will also be presenting his poetry show for adults in Launceston’s Town Hall at 7.30pm on this same day.